An explosion of colour has at last come to the woodland and leat walk. 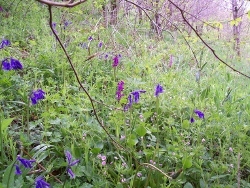 We have a profusion of blue bells under the oak canopy. In places they are mixed with other colours, white of the wild garlic, purple of the early purple orchids, pinks of the red campion, yellow of buttercups, a variety of greens from ferns and mosses to mention just a few of the more well know plants. It makes the walk beside the leat a real joy as well as part of our work. The leaf canopy of the oaks, ash, hazel and beech are slowly reducing the view of the sky about 3 weeks behind our neighbouring areas of Bovey Tracey and Ashburton.